Probably the CT shirt I am most pleased with so far. 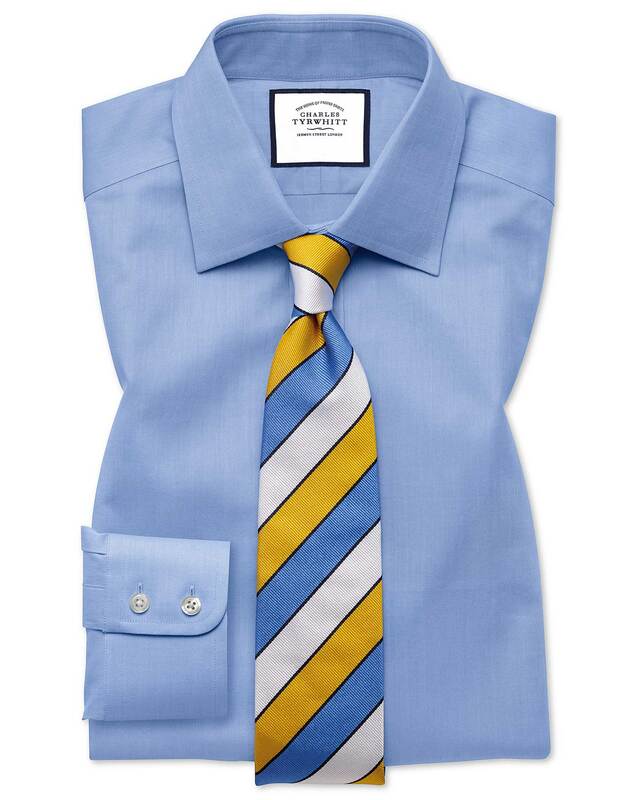 The herringbone weave is superfine, the shirt can be worn under a suit or with casual pants, and in winter and summer. I do think it is definitely mid blue rather than sky blue however. Fabric is lousy, inferior to what I have previously ordered from this site. Response from Charles Tyrwhitt: I am sorry to hear that you have not been as impressed with the quality of your new order in comparison to previous purchases. This is certainly not the norm, as here at Charles Tyrwhitt we strive to provide the best quality products possible for our customers. It is disheartening to hear if we have not achieved this, especially as there should not be any reason for a difference in quality. You are of course more than welcome to return these shirts for exchange, and I am confident that the new shirts that you receive will restore your love for our products. We thank you for taking the time to provide this feedback, I have passed it along to our team, and we hope to continue to improve and impress for our customers.